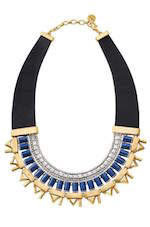 Natalie Necklace -- You can reverse this cobalt blue and gold collar necklace to change up your look. You'll love the genuine leather detail and hints of pave sparkle. 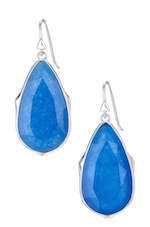 Sentiment Stone Drop Earrings -- Hand-cut, semi-precious Deep Sea quartz set in shiny gold or silver plating. Elegant drops for any occasion. 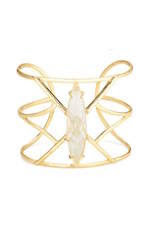 Aria Cuff -- Semi-precious crackled quartz stone set upon a geometric shiny gold cuff. They seem to have beautiful things--I always like the idea of cuffs, but just can't seem to pull them off.